Additive is becoming a part of an integrated production line. This year is poised to build upon the significant headway that the industry made in 2016. 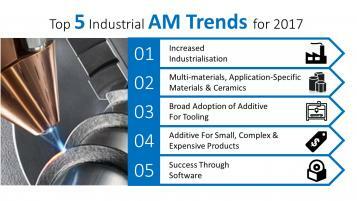 Here are five industrial additive manufacturing trends you’re likely to see in 2017. 1. Increased Industrialization. 2. Multimaterials, Application-Specific Materials, and Ceramics. 3. Broad Adoption of Additive for Tooling. 4. Additive for Small, Complex, and Expensive Products. 5. Success Through Software.